I’ve been bearded most of my life. We both laughed, and I was busted! Clearly my uncle had a similar sense of humor to mine. In truth, the beard probably remains more out of laziness and an aversion to shaving than it does for any religious reasons. Oh, and I also think I look better with the beard than without it, so I guess vanity has something to do with it too. But seriously, as my son reminded me in a recent quote he shared with me, there was a time when a man’s beard not only had spiritual implications, but was also viewed as being akin to his salvation. After I was done chuckling and sneering over that one, I was reminded of the story of how King David sent a delegation to Hanun, the heir to the Ammonite throne, on the occasion of the death of his father. Hanun’s advisors suggested that David’s men were spies, and so the Ammonites seized the delegation and humiliated them by cutting off half of each man’s beard (2 Samuel 10:1-4). There was a peculiar sacrosanctity to the beard, which is also seen in Samson’s case, that in shaving one’s beard, would lead one to being viewed as being less than a man (Judges 16:19). In Old Testament times, basically there was something about a man’s beard that was held in high and religious esteem. A beard was a sign of maturity in the ancient near east. It was synonymous with the word “elder.” At the risk of digressing too far, this is interesting when compared with some cults, such as the Mormons, which send out young missionaries who, while called “elders,” ironically often appear too young to even shave, much less grow a real beard. But I’ve digressed. Many ancient monuments often displayed bearded figures, and in some cases, even women were portrayed with fake beards on formal state occasions. The Old Testament likewise had some pretty strict rules about altering and trimming the beard (Leviticus 19:27). So severe was this that, when it came to a prophet’s beard, shaving it was viewed as bringing on the judgment of God (Isaiah 7:20). The fact that in some cultures, such as Greek and Roman civilizations, men were typically clean-shaven, only reinforced Jewish pro-beard stance. Essentially the beard was the man’s glory. 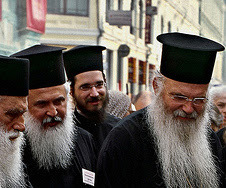 Going back to the previous quote of the Russian Orthodox Church, that almighty reverence for the beard seems to have remained well into the history of the church. Let’s stop and think about that for a moment. What happened to the church to cause people to think that their salvation was somehow tied to their beards? I then wondered, what about those poor souls who suffered with follicular challenges, and couldn’t grow a real manly beard? Were they viewed as being lost spiritually, or perhaps as lessor Christians? Or was this merely cultural? At the very least, it begs the question. Had the church of the day forgotten that it is by grace that we are saved (Ephesians 2:5), and not by the beard they possessed? If so, how many other anomalous, peculiar, and queerish things did they also believe when it came to their Christian faith? Fast-forward to our modern western church; are there also some off-beat and screwy things that we’ve embraced in our Christian walks, which when it comes right down to it, are also inconsistent with the things Jesus taught? I wonder.